MY TOP FIVE UNDER-RATED MOVIES EVER! Now everyone who knows me, knows I love movies, I watch everything and anything because I love the beauty of any story even if it is cheesy, Girly, Tragic, memorable, action packed, mystic ect. But I am one to give critique when my opinion is due, I can be harsh but I give everything I watch my full attention. And to all who hate every movie and every song and every act and every piece of work. BUT GRATEFUL YOU ARE GETTING ENTERTAINED BECAUSE I DON’T SEE YOU DOING ANYTHING WITH YOUR LIFE, KNOW IT ALL. But I am writing this today to give my opinion on my top five UNDERRATED movies (Within my collection) so here they are in no particular order. Enjoy. At number FIVE, we have HIGH FIDELITY. Ultimately one of my favorites because the plot is simple but effective, a guy who is surrounded by so many problems and dreams, he prioritizes them by makes lists upon his everyday life, the focus of the movie is the listings of his past relationships to find out where he goes wrong and ends up single. It is non-stop laughing and with Jack Black within the cast doing what he does best you know you are in for a giggle. The cast is small but they give it their all, I believe in the states the book and movie did do well but here in Britain I am not sure, I have introduced this movie to most people I know. Also it is not for the dumb-watcher, the articulated use of words and reasoning behind some of their action may baffle some who are of the lower IQ (Sorry, but I know there is people out there who spoil movies like these by pretending to yawn and fidget.) If you would like and intellectual movie that is closer to real life than any other, this would be at the top of my list. 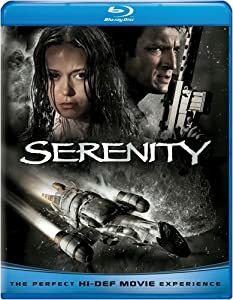 From the maker of Buffy and Angel, Mr. Josh Whedon delivers to us Serenity one of my best watched DVD’s and shows us a low class salvage ship and its crew along with passengers, bark on a mission to reveal the evil side of the Alliance (The Government) to the people but when one of the Serenity’s passengers turns hostile the government is soon on their trails as the rouge passenger is of bigger need to the government but must hurry before the cannibalistic Reavers catch up with them. V for Vendetta was a comic book before a movie the reason I think that it did not do that well was it came out around the same time as the London bombing and companies thought it may be in bad taste to release and plaster everywhere a movie about a terrorist (With good intension) But killing is still killing. The movie itself is great; it is futuristic based not too far. Set in London itself, when the government begins to scare and take indecisive action to bring fear to the people, so the people look to their government for help, a government experiment who goes by the name of V, takes charge and wages war against the government, along with the help of Evey (Portman) a working class girl, they stand to bring down the system that has brought the country to its knees in quivering fear. This is teen movie that pulls you in from the first fifteen minutes, the plot of the movie is about a young teen named James who has to go and get a summer job at Adventureland, a run down, cheating and lacking-in-work theme park. But when James meets the people who work there he feels more at home there than any college, the love interest for James is Em (Stewart) a young woman who does not know what she wants. This movie is in my top-ten best movies of all time (Along with High Fidelity) Nick is a love lost teen in a band who go through band name changes like governments with laws (A lot of times) But Nick meets Norah by chance as Norah tries to make Nick’s Ex Triss Jealous unknowingly asking to be his boyfriend. But as the night starts they hear on the radio about the best band ever WHERE’S FLUFFY is playing somewhere in the city (But it is in a secret location) they go on an adventure to find the band but also have to find Norah’s drunken friend who is running around the city. So there it is, the top five, I do have a tone more but I would be here forever, so I will just name a few of them here. I will be continue to write some of more of my TOP-TEN and TOP-FIVE things here like BEST MOVIES and BEST SONGS. I love Serenity and Nathan Fillion… Summer Glau is so Yummy! I do have all these movies Alex. Serenity–and Firefly–were spectacular. I heard they were considering a series based on the nemesis in Serenity, who sees the light at the end. Sadly that’s never happened. It too would have been sophisticated and entertaining. great post. Would love to share it with others. Thanx!